Overview A STRANGER FROM VENUS has the power of life and death at his touch, and Academy Award®-winner Patricia Neal is a woman caught up in the biggest event in history in this touching and haunting story of "first contact" with a peaceful and advanced intelligence from another planet. My thoughts Well, what do you know? 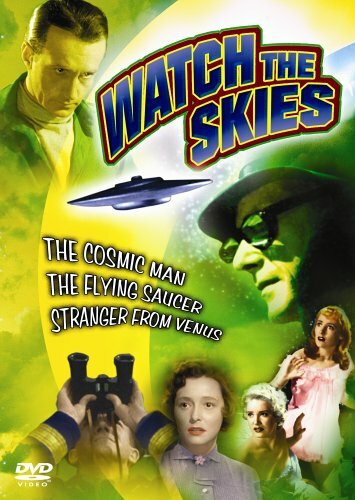 The second film from the ”Watch the Skies” box set is also a derivative of The Day the Earth Stood Still, just like The Cosmic Man. And just to make sure, the producers hired Day's female lead Patricia Neal. Just like The Cosmic Man this movie is mostly talk and very little tech. Well, we do get a saucer but it looks about as high tech as the saucers in Plan 9 From Outer Space. It's not an awful movie, but it hasn't aged very well. Viewers acustomed to today's filmmaking would probably be bored to tears. Personally I found it mildly interesting, but unless you're a fifties genre movies completist you might as well skip it. Overview The calving of an Arctic iceberg releases a giant praying mantis, trapped in suspended animation since prehistoric times. It first attacks military outposts to eat their occupants, then makes its way to the warmer latitudes of Washington and New York. A paleontologist works together with military units to try to kill it. My thoughts Still being in a 50's mood I decided to re-watch The Deadly Mantis. It's probably unique among the big bug movies, in so much as it's not a mutated insect. Instead the premise here is that this is a prehistoric insect that was this size to begin with. The mantis actually looks pretty good. Most giant insects in these movies look pretty crude, but this one doesn't, except when it flies. It moves rather awkwardly, though. It's a pity that there is no making-of feature, or even some behind the scenes photos. I would really have liked to see how big the mantis model was in reality. There is some rather irrelevant, but still interesting, documentary footage of the construction of the DEW Line (Distant Early Warning radar defense). But hey – you have to overlook little things like that if you are to enjoy these movies. And if you do, you'll find that it's an enjoyable piece of hokum. Craig Stevens and William Hopper are good. The female love interest – Alix Talton – fails to generate much chemistry, unfortunately. For better or for worse, they don't make them like this any more. Whether you like it or not may well be a generation thing. I enjoy these movies a lot, and this is certainly not the worst of its kind. "For better or for worse, they don't make them like this any more. Whether you like it or not may well be a generation thing. I enjoy these movies a lot, and this is certainly not the worst of its kind." But then there is nothing i dislike more than Gangster Rap ( except possibly techno ). I would suggest that too is generational except I love bits by George Burns (the original rapper). Yeah, I guess we're of the same generation, David. I want the sixties back! Better memory? Oh, how I wish that was true... I'm a month short of 67, and I have lousy memory. It's just that some things stick better than other. I have read Paul Blaisdell's biography "Paul Blaisdell, Monster Maker", so that's probably the reason that I remember that particular monster. Many of his creations look incredibly crude, but it's because he was given almost no budget at all. It's no secret that Roger Corman was incredibly stingy. Or frugal, if you like. It's actually a very interesting book. 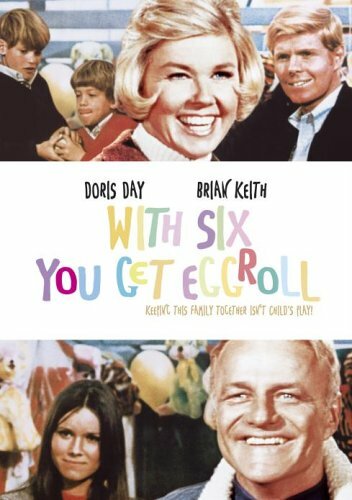 Overview Doris Day and Brian Keith have a field day in this clever up-beat romantic tale of love, marriage, kids and coping. Abby (Day) is a self-sufficient widow with three rambunctious sons. Jake (Keith) is a mild-mannered father of a stubborn 18-year-old daughter. Put them all together and you've got one outrageous family! Featuring a hilarious supporting cast, including Barbara Hershey, Jamie Farr, William Christopher and George Carlin (in his first movie role), this high-spirited laugh fest will keep you smiling long after the happy ending. My thoughts As my friends know, I am a huge Doris Day fan. People have said that Doris' later films are not her best, and this being her last I wasn't sure that I was going to enjoy it. I need not have worried. It may not be her best, but it's certainly not her worst either. It plays a bit like a sitcom, and there isn't much chemistry between Doris and Brian Keith. But there are some good bits, and Doris still looks good in her mid forties. I don't know why she decided to not do any more films, but the upside is that she quit while she was still at the top. If you're a Doris Day fan, then this is a no-brainer. If not, well, it's an hour and a half of harmless entertainment, but certainly not essential viewing. Overview A fictional political thriller based on the London terrorist bombings of 7/7 and the subsequent police order to 'Shoot on Sight', the film unfolds the turmoil of the life of Tariq Ali, a Muslim police officer at Scotland Yard. Commander Ali, born in Lahore and married to an English woman, is tasked to investigate the police shooting of a suspected Muslim terrorist in the London Underground. Distrusted not only by his superiors in the police but also by his fellow Muslims, he finds his inquiry hampered from all sides. When evidence surfaces pointing to the slain man's innocence, as well as the existence of a terrorist cell operating in his own back yard, Tariq must face the realization that, sometimes, the right decision is the hardest one to make. My thoughts This is a film about racism and terrorism. The fact that it is a low budget film is actually a plus, because it keeps things realistic. It may seem a bit like a TV drama, but again not a problem in my opinion. Some great acting helps a lot. Naseeruddin Shah is really good as Tariq Ali. Brian Cox is almost always good, and this is no exception. Over all the film shows a very balanced view of the problems. Sure the muslim extremists come across as scary, but then again pretty much all extremism is scary. In dealing with "With Six You Get EggRoll" i think you hit the nail on the head about why it is sometimes bypassed. Although it was one of Doris Days top selling films, it is the lack of chemistry between her and Keith (i put this off on Keith .. though I like a lot of bits he did he never seemed warm and comfortable) and the 'format'. It does have the feeling of a mid-60s tv sitcom and not so much a film. It is fun and bouncy but really for me lacked the Doris Day touch. yeah .. lacquered may be a bit harsh .. but i think her time with animals was becoming much more important. Overview Starring alongside Ralph Richardson and Valerie Hobson, Laurence Olivier portrays a test pilot engaged in secret experimental missions in this witty, cleverly plotted World War Two spy drama. Briskly directed by Hollywood veteran Tim Whelan and featuring typically innovative art direction from Vincent Korda, Q Planes is presented here in a brand-new transfer from the original film elements. 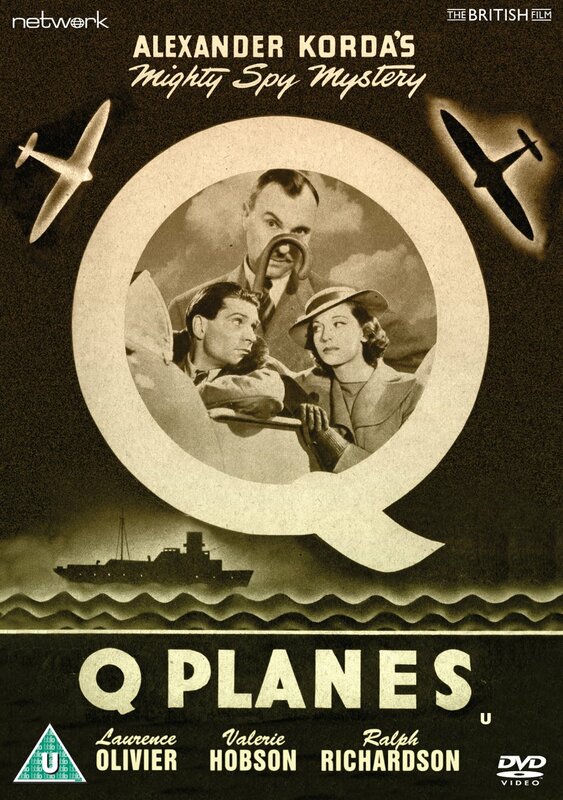 My thoughts Q Planes is a rather odd mix of war drama and comedy. The main story is nonsense, although serious nonsense. Ralph Richardson's role, though, is far from serious. The villains are from a foreign power, but the country is never identified. Being from 1939, one has to assume that they are supposed to be Germans. The DVD cover is headed by “Alexander Korda's Mighty Spy Mystery” and yet Alexander Korda is not credited in the movie. According to IMDb he was executive producer. It's good to see Laurence Olivier and Ralph Richardson together in the same film. They seem to have a good time. And then there is Valerie Hobson playing Richardson's sister, a journalist. It's a far cry from the role that I usually identify her with; Elizabeth in Bride of Frankenstein. A fun little film, but nothing special. Worth seeing for Olivier and Richardson rather then for the actual story. 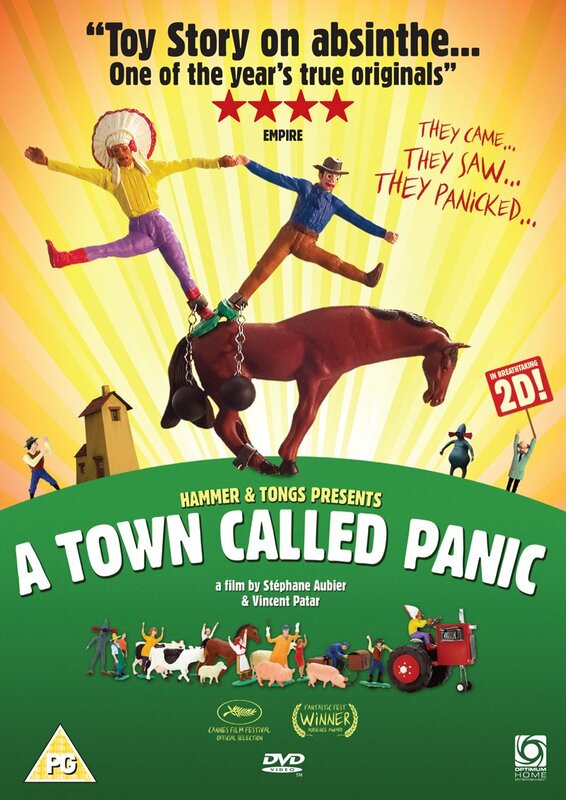 Overview From acclaimed animators Stéphane Aubier and Vincent Patar comes A Town Called Panic, a surreal and hilarious tale of adventure, romance, and villainous treachery in a small village where panic is both name and nature. Cowboy and Indian's plan to surprise Horse with a homemade birthday gift backfires when they accidentally destroy his house. To their dismay, no sooner have they built a new home when it is stolen from beneath their noses by a stealthy and cunning midnight assailant. Strange adventures ensue as the trio travel to the centre of the earth, trek across frozen tundra and discover a parallel underwater universe where pointy headed (and dishonest!) creatures live. With panic a permanent feature of life in this papier mâché world, will Horse and his girlfriend ever be alone? My thoughts Holy crap! This is one of the most bizarre films I have seen in a long, long time. “Toy Story on absinthe” is a fairly good description. Although this is stop motion animation, and nowhere nearly as polished as Toy Story. But that is intentional, and part of its charm. A big difference between the two films is that this one uses toys, but they don't really represent toys. There are no children playing with them. These toys live in a world entirely of their own. The story is almost impossible to describe. It's a bit like trying to describe Terry Gilliam's animation for Monty Python. Absurd might be a good way to describe it. But absurd in a good way. Very good. I loved it. I was surprised, but pleased, that it had not been dubbed into English. The French dialog just matches the absurdity so well that I doubt that an English dub could have made it justice. So don't let that discourage you. Definitely recommended! Overview What would have happened if Sherlock Holmes and Dr. Watson had met as schoolboys? Why, the solution is elementary - nothing but adventure! And that's just what director Barry Levinson (Diner, Rain Man, Bandits) gives us in this special effects spectacular that sends the super-sleuth on his very first case! 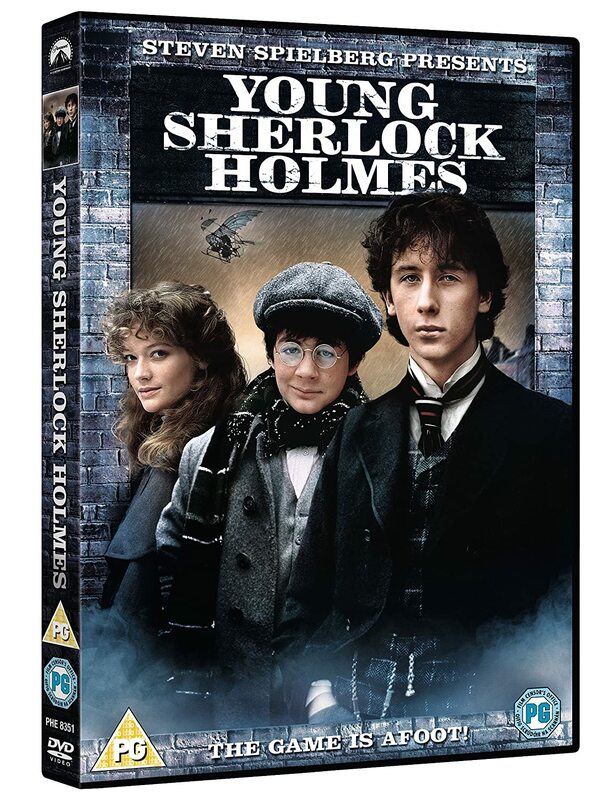 When a plague of bizarre, puzzling murders grip London, young Holmes and his new friend Watson find themselves unwittingly entangled in the dark mystery. So, "the game is afoot!" And the budding detective is off on an adventure to solved the most amazing case of his most extraordinary career! My thoughts I liked this film a lot. Parts of it seem to be inspired by Indiana Jones and the Temple of Doom. Some people say the similarity is just a coincidence, but I don't believe that. The film is also famous for having the first CGI character; the knight in the stained glass window that comes alive. The rest of the effects in this film are stop motion or physical effects. It's quite an enjoyable prequel to the stories of Sherlock Holmes, although with a bit of a downbeat ending. And make sure to watch it all the way through. There is an important scene after the end credits! My thoughts Bert I. Gordon (aka Mr B.I.G.) isn't the most brilliant filmmaker in the world, but for a B-movie fan his films were almost always a lot of fun. 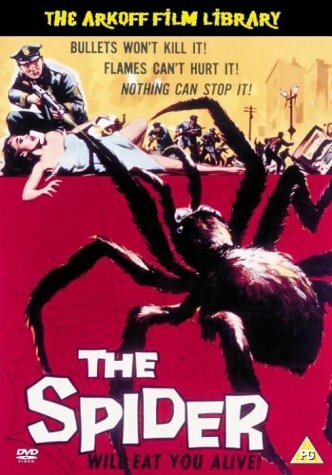 There are lots of things wrong with [Earth vs.] The Spider. I guess you'll have to disregard the fact that animals cannot grow that much bigger and still keep the same proportions. It's physically impossible, but it kind of goes with the territory of big bug movies. The spider seems to be a tarantula, but tarantulas don't spin a web. The web looks like a cargo net, and not anything like a spider's net. The spider easily fits inside the school auditorium, but when we see it outside it's as big as a house. The spider is killed by an electric arc that is at least 30 foot, but the electric lines into the cave lie next to each other without any spark-over, and people hold the electrodes with just a rubber glove. The actors playing teenagers are way too old for their parts. One of them is in his mid thirties! Despite all this there is something about this film that appeals to me. I can't quite say what it is. The story might be hookey, but at least it keeps the action going. The effects are inventive, if not always totally successful. But they're still more fun than a lot of the CGI crap we see today. Overview After getting a taste for blood as children, Hansel (Jeremy Renner) and Gretel (Gemma Arterton) have become the ultimate vigilantes, hell-bent on retribution. Now, unbeknownst to them, Hansel and Gretel have become the hunted, and must face an evil far greater than witches...their past. My thoughts I guess I should be thankful that there were so many bad reviews for this film, so therefore I came to it with very low expectations. And I thought it was a lot of fun. Sure, it's no masterpiece, but it was entertaining enough for me. I really liked Gemma Arterton. I have only seen her in a few movies before, but she didn't make a great impression on me then. She did now. Jeremy Renner and Famke Janssen were OK. I don't quite see why this film has gotten so much hate. Perhaps it was too violent for some. But hey, it's from the director of Dead Snow, so what did you expect? The rating should tell you it's not your average children's fairy tale. So, it probably won't make my all time top 100, but it was decent enough entertainment. And just long enough for my taste. Your right this is a fun film. Another good reason I don't pay too much attention to critics ..